So instead of spouting more cliches, I thought I would stroll along memory lane and remind you of E’s earlier appearances on this blog. Here she is blowing out the candles on her 9th birthday, when I had only been blogging 3 months. And here she is on her 10th birthday, looking like she’s costumed for a Harry Potter movie. And here she is actually posing for pictures on her 11th birthday. You may notice two things about these birthday posts: First, they all feature some luscious, not fat-free dessert. Second, except for once on her 14th birthday, E stopped allowing me to post her birthday photos on the blog. So it is quite a feat that today I’ve been given permission to post a photo of her taken just three days after her 18th birthday. 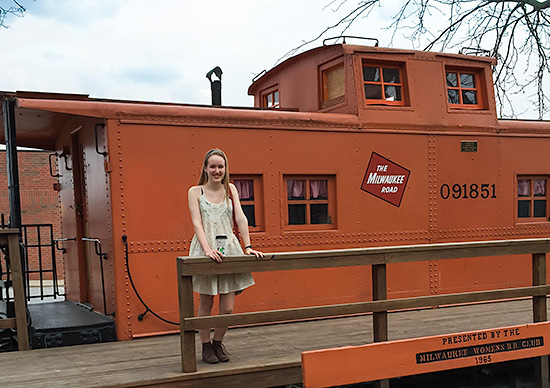 Last week E and I took our final college tour (she has to choose one by May 1), and while driving from one college to another, we stopped for coffee and leg-stretching in the town of Marion, Iowa, where we discovered several irresistible antique stores and this train caboose. For her birthday, E continued the family tradition of choosing an untraditional dessert instead of birthday cake. She specifically asked for my husband’s bread pudding, which as I’ve mentioned before, contains more fat than you can shake a stick (of butter) at. Well, that wasn’t going to happen. Instead, I adapted my Pumpkin Bread Pudding to use bananas, and she loved it. It’s an amazingly decadent tasting dessert, but unlike some of E’s earlier birthday recipes, it contains no added oil, chocolate chips, or coconut. The rum or brandy in the sauce added an adult flavor that seemed perfect for an 18th birthday–her first as an adult and her last here at home with us. If you don’t want to use alcohol, try substituting a half teaspoon or so of rum extract. Put the non-dairy milk into the blender along with the banana, maple syrup, sugar, cornstarch, vanilla, baking powder, and spices. Blend until smooth. Pour it over the bread, using a silicone spatula to get out every drop. Stir well to completely coat all of the bread. Set aside to soak for a few minutes while you ready the pan and preheat the oven. While the pudding is cooling, make the sauce. Place the apple cider and maple syrup in a small saucepan over medium heat, and bring to a simmer, stirring often, until reduced to about half. Carefully add the cornstarch mixture and stirring constantly, bring to a boil and cook for another couple of minutes, until mixture is no longer cloudy. Remove from heat and add the brandy or other spirits a little at a time, to taste. Stir in the nuts. Poke a few holes in the top of the bread pudding with a toothpick, and pour the sauce over the top, distributing nuts evenly. Cut into squares and serve warm. Your daughter E is beautiful ! Thanks for all the wonderful recipes, I have a notebook full of them ! Let’s revisit this recipe and swap the white bread for a healthy whole grain bread. You are a big girl now. You can rise above dead zone white bread to live healthy. Stephen, I never said to use white bread. White or whole grain, it’s your choice. No need to be rude. I was intending to be supportive of healthy desserts. In my experience in France, French bread is white bread. Further, a straight swap with just any whole grain breads does not optimize the recipe. My gut tells me a careful review to whole grain bread candidates would be fruitful in optimizing the recipe for taste, mouth feel and nutrition. And what better organ to trust than my gut. We have come so very far in awareness of respectful treatment of others, but the posts in response to your (always generous) sharing of your food knowledge are important reminders of the demeaning effect, even if unintended by the author, of our choice of words. The offensive and demeaning language of “you are a big girl now” with the follow on of behavior correction is the larger issue. That this was not immediately obvious to the poster reveals how insidious the word choice problem is. Replace the word “girl” with the word “boy”, and many men would find the post equally insulting addressed to them personally. I love this coming of age post through birthday desserts!! 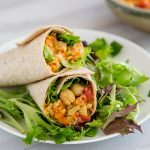 I remember these blog posts with fondness, too, and what a wonderful example it was to see a beautiful thriving active girl, growing up vegan!! You must be so very very proud of her and what a intelligent and beautiful young woman she is becoming. I wish her, and you and your husband, all the best as she makes this decision. The future is bright ( and sweet with this excellent banana bread pudding)!!! Susan I have recently started visiting your website and I am in love with all your recipes. Keep up the good work and happy birthday to your beautiful daughter. 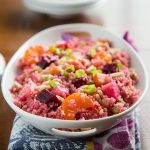 White or whole grain – I love that you always make your recipes versatile!! AND I like your courage to address rudeness. Susan, thanks for the recipe. I made the pumpkin bread pudding and loved it and can’t wait to try this. 🙂 E seems like an amazing young lady and you should be proud. Stephen, in the US you can generally find whole grain French bread relatively easily. In any case, white bread once in a while for a special occasion isn’t the end of the world. Perhaps there is a language barrier and you didn’t intend it, but for future reference, telling a grown woman that she is a big girl now comes across as very condescending. I like your recepies, a lot, often I adapt them, like with any blog I follow, because I am a big girl and I love all bread, Stephen, white and wholegrain, and pinky purpleish redddish when I put beetrott in it (yes, I make my bread) and because I am a big girl like everyone here, Stephen, I read and then choos what I like. Susan, you rock! I love those american recepies of yours to match my italian ones mixed with (very few) british ones (they are not really famous for food, are they?) and far est ones! Take no notice of sarcastic patronising attitudes and keep enjoying making us happy! This looks wonderful and happy birthday to your (not so little!) girl! MMMMMMM…. I just adore/ as does my hubby/ your pumpkin bread pudding! He practically drools when he sees the loaf of french bread going into the grocery cart!! 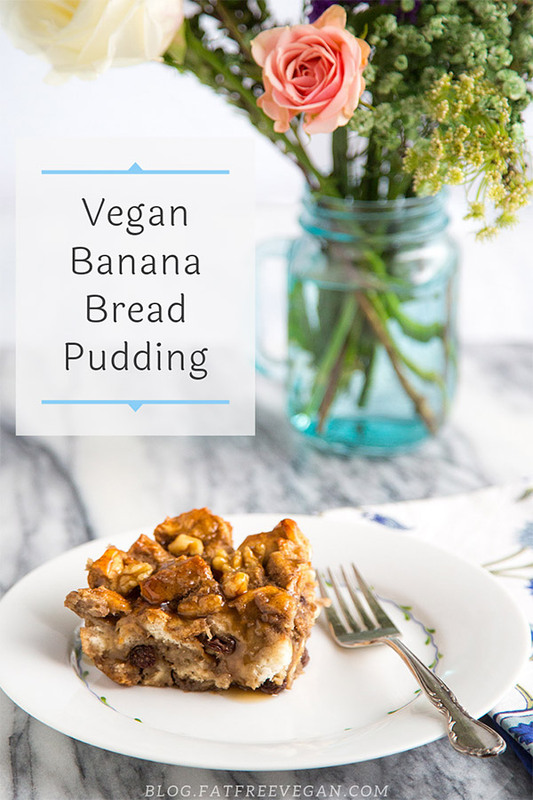 I am thinking about using whole wheat bread that I bake myself instead- this way there will be no giveaway hint that we are going to indulge in desert for 5 nights… which is how long it takes the two of us to fully indulge in your bread pudding! This looks to be spot on for Mothers Day- agreed???? When I cook my 5# of white potatoes in the pressure cooker- I make a half recipe of your mushroom gravy- and dinner that night is mashed potatoes & gravy with a side of a colorful veggie… and we feel as though we have indulged in a turkey dinner- cause that is what your gravy reminds us of. Thanks for this beautiful recipe, which is also timely, as I will make it this weekend with bananas that need using (can’t wait to taste!). ‘ E and caboose’ is such an interesting, nice photo. I’ve read your site for a few years, and can say that you have prepared your daughter well for life– she is very fortunate. It’s up to her, now, and she looks confident and ready for the challenges ahead. Well done! Thank ou for ALL you do, Susan, to share yummies and encourage healthier living. You are awesome! I can’t wait to hear what college she ends up choosing! How many did she visit? Thank you for this recipe. I have a load of bananas and this sounds terrific! Your post about your lovely daughter’s 18th birthday brought tears to my eyes. I certainly understand that feeling of “How did they get so old, so fast?” Mine is now 25, and it’s still weird. Hug them while you can! Does anyone know if I can replace rum extract with anything similar? Oh my goodness, you have just finalized my 10-year-0ld daughter’s future: she is NOT allowed to turn 18!!!! A very touching glimpse of my present and future-come past before my eyes. Thanks for being brave for the rest of us….. 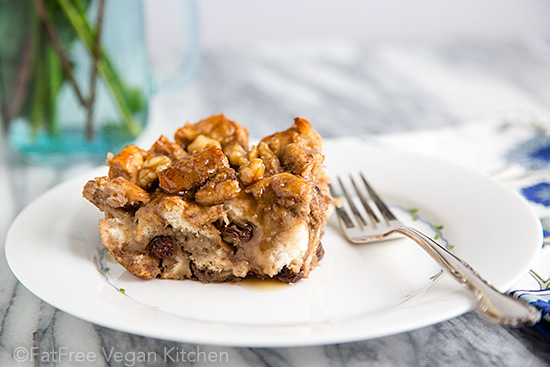 This looks amazing and I must make for hubby soon since he’s a serious bread pudding fan. Thanks! I can’t to try this recipe in my kitchen. Would it taste as delicious as the picture? In your future post especially when its about food and the kitchen could you include more pictures? Images makes blogs and articles more appealing to people. This doesn’t need to go on the web page – it is for your use. In your Best Rigatoni and Vegetable Casserole, you asked for possible corrections. In this Banana Bread Pudding recipe, you have 1/4 cup maple syrup listed twice. Thanks again for all your great fat free recipes. Thanks, David. Actually, I use 1/4 cup maple syrup twice in this recipe–once in the pudding itself and again in the sauce. I need to think of a way to make that clearer. I really appreciate the heads-up! Your daughter is beautiful! I started getting teary eyed AGAIN reading your story- my DS has chosen Stanford and we went to admit weekend. It was wonderful to spend time with him there (a little most of it was on campus for him getting to know the place) and so I was remembering everything and h0w fast it did go by. Thanks for this wonderful recipe. May is bringing us many moments to celebrate and this looks like a good one to do it with! 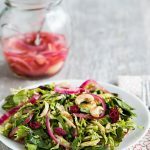 I love to see recipes like this! Just because I am vegan doesn’t mean that I don’t want to eat the same types of food that my friends and family eat; and if I can serve them something familiar that is veganized and delicious it goes a long way in my quest to show them that cruelty free is the way to go. 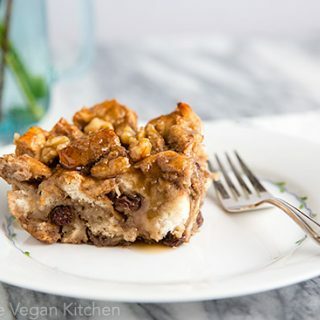 Bread pudding without eggs? What!!! So excited to try this recipe. Ill have to give this a try – looks amazing. Dear Susan: I know how you feel. My daughter, Kat, just graduated from college. She is 22. Her twin brother has a year to go. 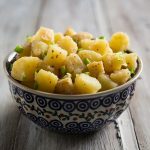 This looks like an amazing recipe! I love bread pudding in all different flavors. The topping “sauce” is a great touch. I’ll have to try that next time. Daaaaaaang! That makes me feel old! I’ve been reading your blog forever, and remember when she was so young! Sounds like a great dish too. 🙂 Thanks for all of the great recipes over the years. She has grown into a beautiful young woman!!! I feel as though I’ve watched her grow up through your posts over the years. I made this today with a delicious french bread (Yep! it was white 🙂 from Whole Foods. Just used cinnamon and nutmeg for spices and I added another banana sliced to the bread cubes. It was fantastic! Thank you for a great recipe. Happy Mother’s Day! Both the recipe and the story you shared are heart-warming and lovely! Congratulations on E turning 18! You know what they say Susan, ‘time flies when you’re having fun’ — and from the looks of your blog posts from day 1, you have been having FUN and we’re grateful that you took the time to share it with us. Thanks for making this easy to follow! I tried this recipe last night and used 1% milk, because that’s what I had on hand. I wanted to let you know that it is my new bread pudding recipe! Both the mother and I very much enjoyed it. Thank you for sharing this one with us! Great recipe! This is definitely a delicious and filling treat, thanks for sharing it. 63 grams of carbs per serving? That’s quite high, even for a dessert! Are you meeting your weight loss goals eating this way, Susan? I would struggle with the blood sugar highs and lows that your low fat, high carbohydrate diet would inevitably cause. Once I started eating more fat and cutting back on added sugar and flour, I finally reduced my joint pain and lost weight. The story you wrote was beautiful. Congrats to your daughter! I made this the wknd. After thanksgiving. My husband could not get enough!! This wknd I will add nuts and blueberries, and try a different bread! Its a new fav. In our home now. Love your recipes! Thanks to your continuing recipe inspiration, I made my version of your recipe this morning, as we looked out onto a beautiful snowy mountain in Asheville! You’ve been a WFPB mentor for 5 years and I appreciate all you do. I wish I could send you a photo of my own bread pudding. I’d love a photo of both the bread pudding and the snowy mountain. Asheville is my favorite city, and I will be visiting soon, but I think the snow will be gone by then. An outstanding recipe that takes well to substitutions. Can’t wait for a special occasion to make it again! Thank you! I used to live just down the road from that caboose in Marion! Fun to see when I was just looking for a way to use up some of my bread that is starting to go stale, but without all that dairy. I hope your daughter has enjoyed school wherever she ended up, I am sure this recipe will work out great if I can make it to the store to find the remaining ingredients.